Manchester City and England star Kyle Walker won Twitter today as he joined in the Harry Maguire meme-fest with this belter. The 28-year-old celebrated the win in style on social media as he joined in with the love-in Maguire has been getting ever since a picture of him with a fan went viral following the victory over Colombia in the last 16. 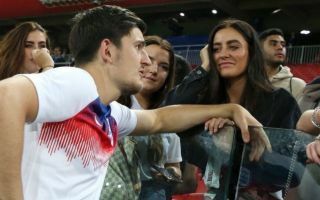 The Leicester City defender can be seen trying to look suave chatting to an attractive female supporter, and it’s little surprise the picture was cropping up everywhere today as he scored a superb opener against Sweden in a 2-0 win. Maguire has generally been a surprise hero for the Three Lions in Russia this summer, with some solid displays at the back and now this memorable first goal for his country to help them on their way to a first semi-final appearance since 1990.